The only patented spatula that locks at three different lengths, making storage much easier, and gives the user greater versatility when in use. The Brazilian rosewood handle comfortably fits in the users hand. The heavy duty stainless steel construction makes this product highly durable, and the wide serrated edge is perfect for large cuts of meat, and for cutting into meat. The head also comes with a built in bottle opener. SmokePro Jerky Racks (Fits 24 inch Pellet Grills) Your pellet grill is big, but sometimes you're fighting for more space. We get it. That's why we're bringing you almost quadruple the cooking surface area with our SmokePro Jerky Racks. With three removable racks at your disposal, you'll be able to tackle any smoking job, from jerky to fish, wings to ribs. All without breaking a sweat. 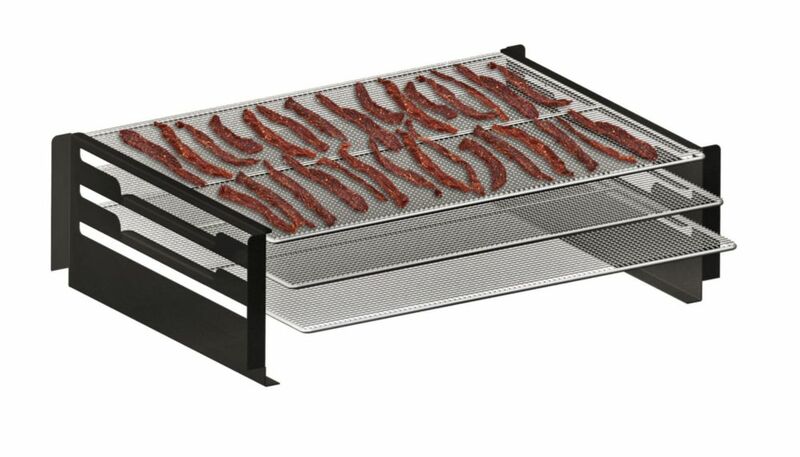 SmokePro Jerky Racks (Fits 24 inch Pellet Grills) is rated 4.8 out of 5 by 20. Rated 5 out of 5 by Colodaddy from Great for smoking salmon These racks are great for smoking salmon. Doesn't stick and you can load additional cooks. I was able to smoke ribs and salmon at the same time. Both were awesome! Rated 5 out of 5 by DBARK from Awesome addition I picked this up to smoke a bunch of salmon. I've also used it to cook a bunch of chicken wings. It was easy to install and love how the trays slide in and out to load up the racks. It's a must have. Rated 5 out of 5 by Jakeman from Fits right in, no assembly! Works great! Able to cook a huge amount of jerky at one time. Can also cook more ribs, or more any thing at one time. Well worth the price.